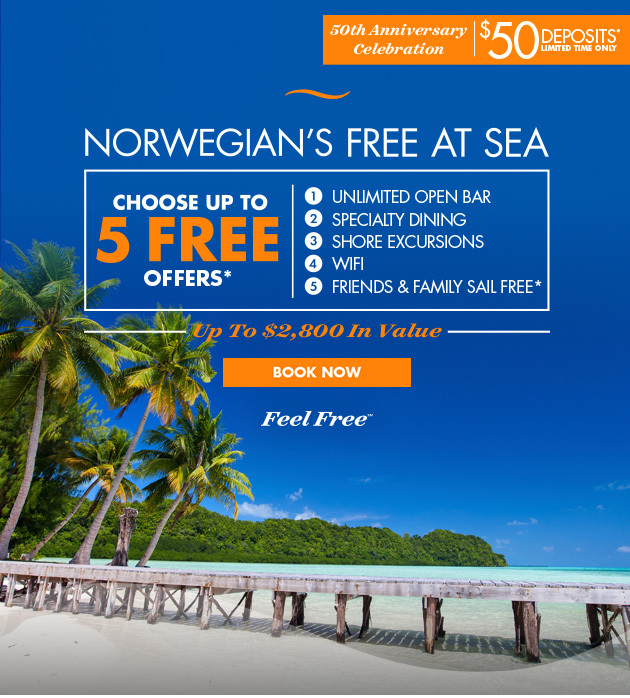 Norwegian Cruise Line currently has a Sale. Don't miss it. Up to $2,800 in Value! Book an Oceanview cabin or higher and choose from four amazing offers. Book a Suite or the Haven and get all four offers for FREE! The 1st two stateroom guests get FREE glasses of wine, beer, spirits, cocktails, juices ad soda for your entire trip. (Normally priced at $59 per person, per day.) All guests 3-20 yrs old or staying as the 3rd or 4th guests in the stateroom will receive a free soda package. A few restrictions apply. All stateroom guests (3 yrs old and older) eat at one of Norwegian Cruise Line's award winning specialty restaurants every night of your cruise. (This is normally priced at $140 per person for a 7 night cruise.) A few restrictions apply. Receive a $75 per stateroom shore excursion credit for each port visited on your cruise. Get out and swim with dolphins, tour The Leaning Tower, or play 18 holes at a world class resort. This is your vacation so take our money and splurge on shore.